What are Gulp and Grunt capable of? Before starting the comparison, it will be got if you first have some knowledge about what exactly these tools do and why you might want to use them. As mentioned earlier, both these tools assist in automating the functions and are quite popular in the web development sphere. The web designers usually use them to carry out common tasks such as debugging the code, compressing images, applying different changes to the server or the files present on the server. Several of these tasks are quite simple but they can consume a good amount of time especially in the case of a large website which requires regular changes. That’s where Gulp and Grunt step in. Locating the actual reason behind errors. Gulp vs. Grunt: Any major difference? As both the tools perform almost similar tasks, there are only a few things on the basis of which you can compare them. The major difference lies in the way Gulp & Grunt accomplish different tasks. The first difference you need to know is that Gulp uses a series of plugins to carry out each task. On the other hand, Grunt uses the plugins but to perform multiple tasks. Gulp vs. Grunt: Any additional Support, Community or Plugins Both these tools are backed up by a large & helpful community which consists of global users and experienced developers. Moreover, they also offer a wide range of plugins that can be used to further ease off the task completion process. According to Grunt’s official site, there are approx 6000 plugins for Grunt and 2700 plugins are available on the Gulp’s site. There’s no scarcity of plugins for Grunt and Gulp. 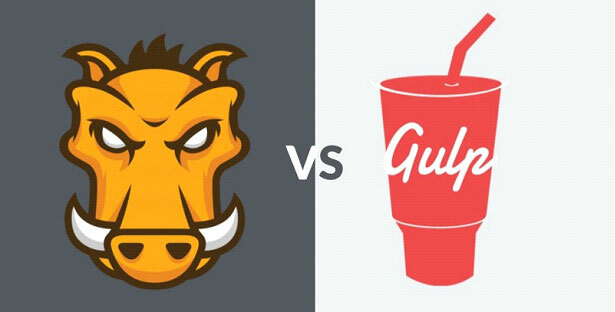 In terms of market share, Grunt owns 70% of the web sector compared to the Gulp’s 30% share. Several things have to be considered while comparing the coding & Configuration of Gulp and Grunt. The Gulp is designed to allow users to use single purpose plugins and code to achieve the desired goals. This has made the creation of Gulp compatible plugins quite easy. Furthermore, as Gulp is about coding and single task plugins, so configuring extensions is a much more standardized process compared to the Grunt plugins. When it comes to configuration, Grunt consumes more time compared to Gulp. Although configuring time is a bit high, but Grunt has a friendly interface making it easy for the developers to set it up. If you are working in a team, then Grunt is the better bet. When it comes to speed, Gulp takes the major portion of the cake. But this advantage might not be that significant because several updates have been rolled out in the past to improve the speed of Grunt as well. The reason Gulp has an upper hand in speed test is because the Grunt uses streams and manages tasks in a memory, which means you can only write one file. On the other hand, Gulp can process several tasks in one go. In this post, you will come across a comparison between the Grunt and Gulp automation tools. Both these have their pros and cons, so it completely depends on your requirements according to which you will be choosing a suitable tool. Article written by Anna Jhonson. Anna jhonson is a experienced web designer that works for markupcloud ltd. The company provide services in psd to html, psd to wordpress, psd to drupal, psd to magento and many more services.